Source: Millennium Global, Inc., used with permission. 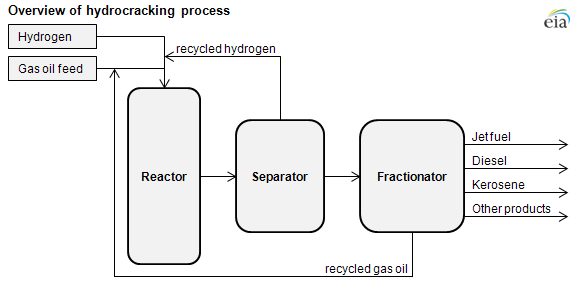 A hydrocracking unit, or hydrocracker, takes gas oil, which is heavier and has a higher boiling range than distillate fuel oil, and cracks the heavy molecules into distillate and gasoline in the presence of hydrogen and a catalyst. The hydrocracker upgrades low-quality heavy gas oils from the atmospheric or vacuum distillation tower, the fluid catalytic cracker, and the coking units into high-quality, clean-burning jet fuel, diesel, and gasoline. There are two main chemical reactions occurring in the hydrocracker: catalytic cracking of heavy hydrocarbons into lighter unsaturated hydrocarbons and the saturation of these newly formed hydrocarbons with hydrogen. The catalytic cracking of the heavier hydrocarbons uses heat and causes the feed to be cooled as it progresses through the reactor. The saturation of the lighter hydrocarbons releases heat and causes the feed and products to heat up as they proceed through the reactor. Hydrogen is also used to control the temperature of the reactor—it is fed into the reactor at different points. This keeps the reactor temperature from cooling to the point that cracking will not occur and from rising too high as to jeopardize the safety of the operation. Many refiners do not have hydrocrackers, but as demand for middle distillates such as jet fuel, kerosene, and diesel increases both in the United States and around the world, refiners may find incentive to build them to increase distillate yield. In the emerging low-sulfur world, the hydrocracker often converts high-sulfur materials, which would end up in marine or boiler fuel, into low-sulfur fuels for vehicles and airplanes. 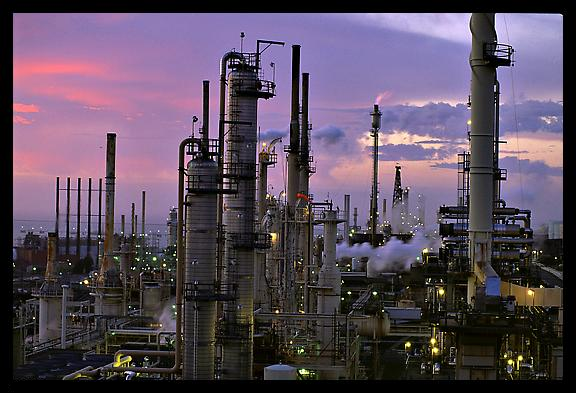 A refinery's ability to upgrade low-value products into high-value products and convert high-sulfur material to low-sulfur material with a secondary unit like a hydrocracker plays a key role in determining its economic fate.